Even though Kevin Costner has had his fair share of duds in the past (Waterworld), he still manages the occasional gem and The Postman for us, is one of those gems. 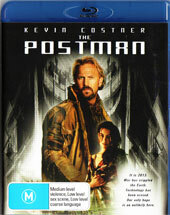 Directed by the man himself, Kevin Costner, The Postman is based on the David Brin's novel of the same name and is set in a post-apocalyptic world gone made, ala Madman and Cyborg. The story of course revolves around "The Postman" who is more a con artist than an actual post man which is where the intrigue begins. That is, in this shattered world, the unnamed "Postman" discovers the uniform and postbag of a former postman from the civilized world and using this disguise, he infiltrates the Pineview colony. Inspiring the people of this time that civilisation seems to be rebuilding, he "promises" to deliver their mail which of course is a ruse. The old saying of "Oh what a tangled web we weave when we practice to deceive" comes into play when the leader of a guild of thieves called General Bethlehem (Will Patton) decides that he wants in on the action after raiding the settlement. Of course, this "role" that the postman has created has huge repercussions on this apocalyptic world and he inspires others to take arms in this interesting and understated action/drama movie. Sure, the movie may have bombed at the box office but Costner and his fellow actors actually make this movie work in a bizarre and almost Mad Max way. Even though the movie has few full moments, due to the length of the film, it also has a few memorable ones as well. It's definitely another Kevin Costner epic that can be watched with a couple of beers and a big bag of treats. The video quality on Blu-ray is a bit of a mixed bag that ranges from poor to good which is a shame but thankfully the high definition sound makes up for this lack of true Blu-ray quality. The battle scenes sound brilliant through our surround sound setup and the dialogue is crisp and sharp as is the great soundtrack of the film. When it comes to extras, it lacks them severely, offering the viewer the original trailer and a documentary on the special effects which is about it. At the end of the day, The Postman was a fun film and even though Costner missed the mark again for mainstream viewers, watching it all unfold is an interesting premise and story.